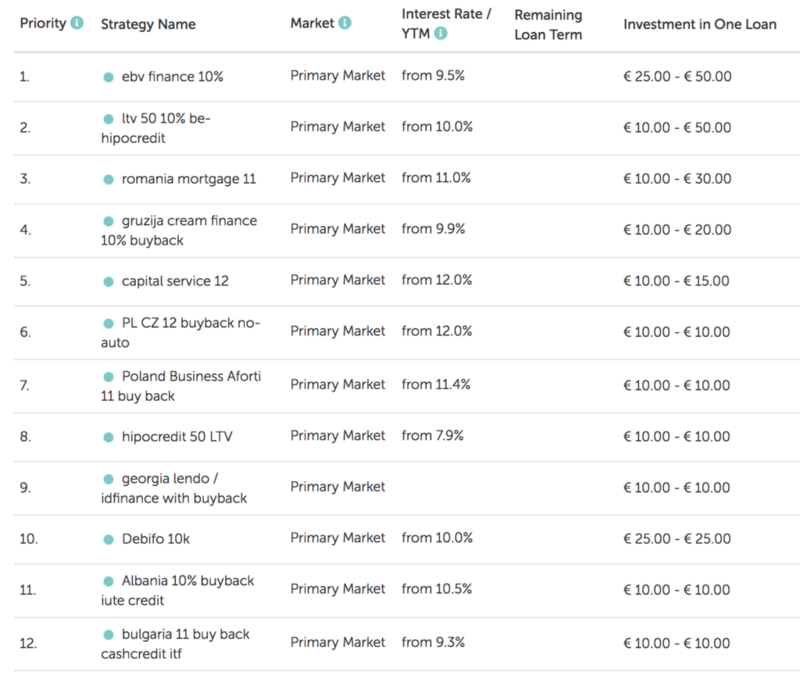 There are 13 posts filed in p2p investing (this is page 2 of 2). These are peer to peer lending sites i use as investor. I recommend splitting your lending budget equally between each. the login interface for some reason doesn’t remember the password. So each time i want to login i have to request new one. Mintos.com is a Latvian based peer to peer marketplace that links borrowers with lenders. Mintos offers various loans including contracts, car loans, small business loans and invoice financing. All loans on the platform are not being provided by Mintos itself, but rather by outsider loan originators or simply put a third party loan originator. Accordingly, certain loan originators can offer a purchase back assurance, which implies that if the loan is deferred for 60 days. I currently hold 3-4% of my networth in this platform. have separate portfolios for separate strategies. possibility to invest in different sectors and different countries. Why i do not like Mintos? As much as you like the returns of Mintos, do not put more than 5% of your networth. do not choose only most ‘profitable’ loans. in case that service is closed or the analysis made dissapears from there. This is the info that every investor should know and consider as a potential risk. 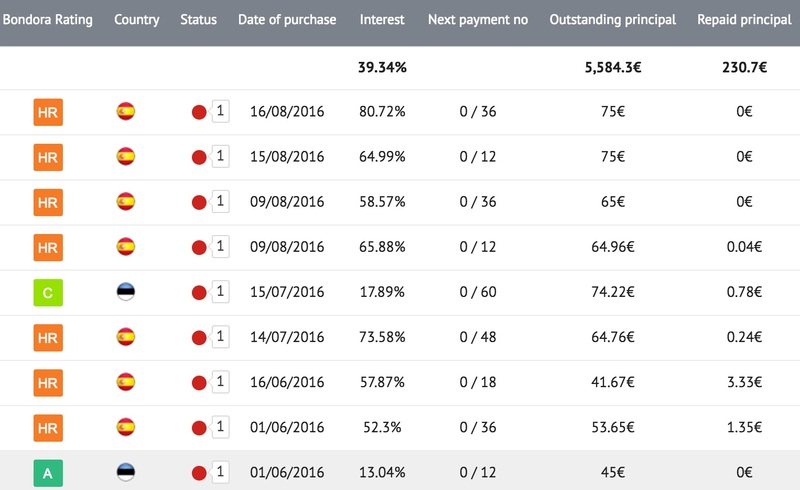 Mintos is one of the fastest growing peer-to-peer lending platforms in Continental Europe. They have gained massive momentum by providing investors a platform that allows buying loan claims issued by payday lenders in Eastern Europe. The acquired claims are backed by buyback guarantees. Buyback guarantee is an insurance product where the platform buys back the claim at nominal value (plus accrued interest) if the underlying loan defaults. In return investors are buying loan claim at a very low interest rate compared to the risk. There are loans available without buyback guarantees but investors have so far primarily acquired loans with these guarantees. I unfortunately recently discovered that the reasons why I thought Mintos is the best platform in the industry are all lies. Mintos states that “Buy-back guarantee is a guarantee issued by the loan originator to the investor for a particular loan, whereas the loan originator will repurchase the loan from the investor if that particular loan becomes delayed more than 60 days”. In reality investors do not have any claims against the loan originators but against Mintos. When troubles come then investors are left with nothing as Mintos’ balance sheet is nearly 30 times smaller than the outstanding size of the buyback guarantees. Mintos needs to properly account for buyback guarantees by classifying buyback guarantees as liabilities. Mintos management should thereafter file for bankruptcy protection as they do not have enough assets or reserves to cover the liabilities. This issue should be raised with the regulators and their auditor immediately before Mintos blows up with over 30 million euro of investor money. Read below to understand why Mintos, not the loan originators, are liable for buyback guarantees. Mintos states that “At the Mintos marketplace, you will find plenty of loans to invest in. Diversify across loan types, loan originators, and different geographies”. In reality over 80% of the capital is being used to fund the operations of Mintos’ actual founder and CEO Aigars Kesenfelds, the son of a Latvian politician and businessman Ivars Kesenfelds who financed Aigars’ payday lending businesses initially. Mintos, Mogo, Hipocredit, Lendo and Banknote are all controlled by Aigars Kesenfelds. See below for documents proving the associations. 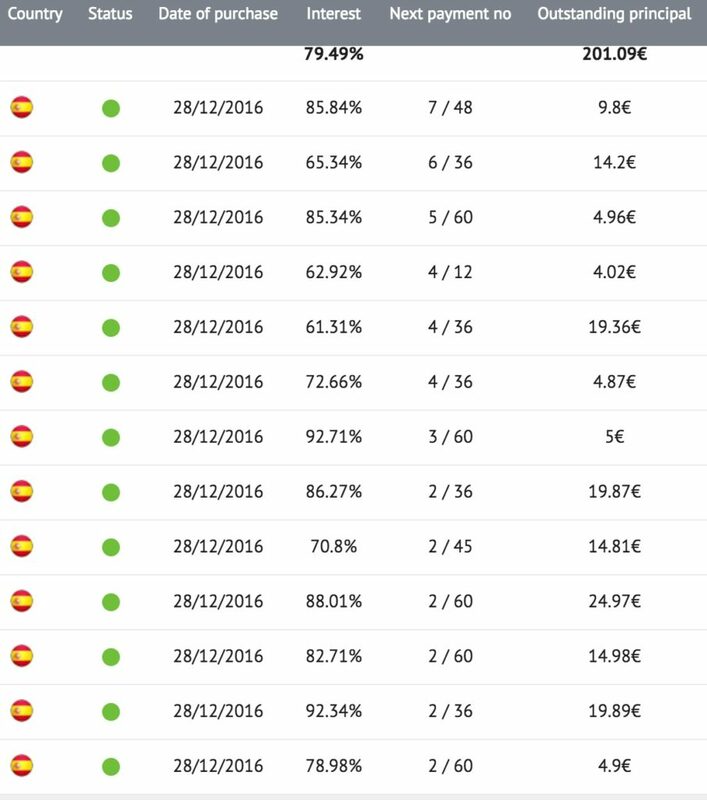 The outstanding balances of the originators on Mintos make up 80.23% of the outstanding portfolio. The rest of the businesses could have links to Mintos but I was only able to verify ownership details of companies where ultimate owners were registered in Latvia and that had meaningful size. Capitalia at first seems independent however one of their board members Mārtiņš Krūtainis is also on the board of Hipocredit. The ownership structure of Creamfinance (6.97% of the outstanding portfolio) lead to Cyprus – a country preferred by Russian capital. Kredito Garantas, Creditstar, Aforti, Debifo, Acema, Aventus, Mano Unija and Agrocredit are all potentially independent. However they collectively make up only 3.91% of the total portfolio and act only as marketing gimmicks to push the diversification statement. Scroll below for the supporting documents and more detailed explanation of the ownership structure. Why is Mintos liable for buyback guarantees? Mintos, as the representative of the Loan Originator, shall act on behalf of the Loan Originator pursuant the cooperation agreement concluded by and between the Loan Originator and Mintos by carrying out the following activities: 4) in case the buyback right of the Loan Originator is exercised, pay the buyback price of the Claim to the Assignee. The assignment agreement further goes to state that buyback guarantee is a right of the loan originator, not its obligation. Only in case the collateral is sold or borrower is declared insolvent by court (which never happens with personal loans), does the loan originator have the liability to exercise the buyback right. However it still needs to be honored by Mintos. 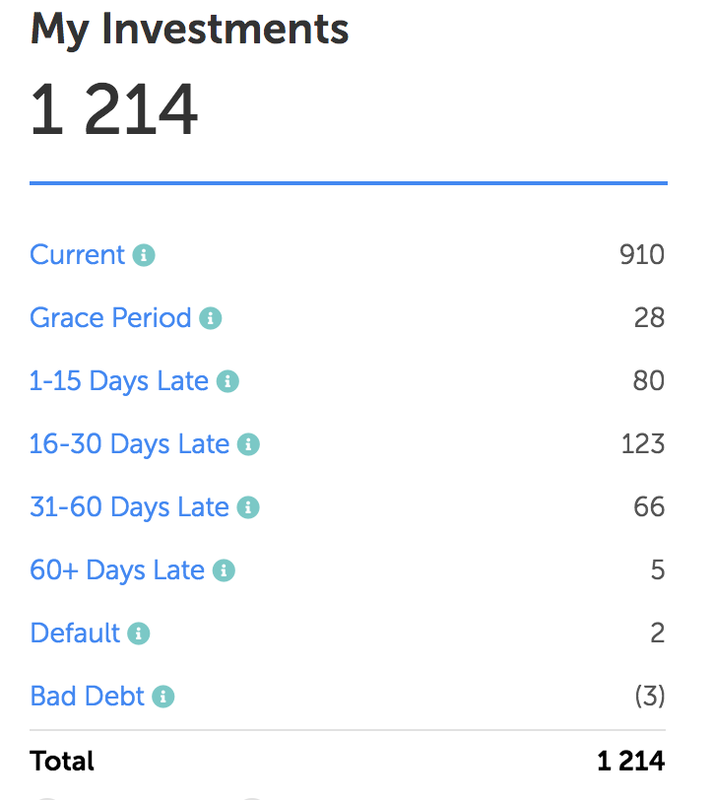 11.2.5. pursuant to unilateral decision of the Loan Originator. 11.7. In addition to the provisions specified in Clause 11.2 of the General Terms and Conditions, if the sale of the Collateral or insolvency proceedings of the Borrower are commenced, the Loan Originator immediately exercises buyback rights granted to it by Mintos giving written notice thereof to the Assignee at its email address. Buyback rights specified in this Clause are exercised by the Loan Originator in the interests of the Assignee to ensure that the proceeds obtained from the sale of the Collateral are used to cover the Claim owned by the Assignee. As of the date of notice by Mintos to the Assignee, the Claim is considered sold back and transferred to the Loan Originator. Why is this dangerous for investors? Mintos states that “Every loan on the Mintos marketplace is pre-funded by the respective loan originator, which, moreover, will keep a certain percentage of the loan on its balance sheet. As the result, the incentives of loan originators and investors are aligned.” In reality Aigars Kesenfelds has designed a structure whereby funds from individual investors are directed to his companies at very low interest rates compared to the risks the companies are taking with all risks staying with the investor. 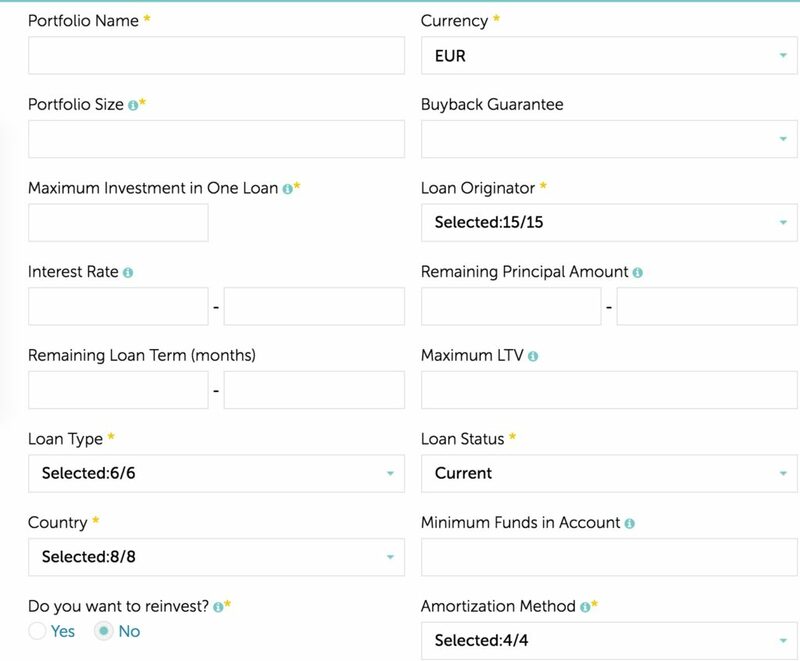 1) In case the loan performs then the loan originator is making up to 138% return on the loans (https://lendo.ge/ is issuing loans at 150% interest rates and passing only 12% to investors). 3) In case the loan does not perform there is no liability for the loan originator as they have assigned the principal claim, plus a small share of the interest, to the investors on Mintos. 4) In case they have sold the loan with a buyback guarantee then they do not have to honor it as by law this liability has been passed to Mintos, a shell company with no meaningful assets and equity. 5) The companies are supposedly keeping a small 10% neck-in-the-game share of the loan to align risks. However point 1 and 2 above shows that this is only cosmetic and in practice they do not have to put any capital aside or get this capital back already in a month or so. 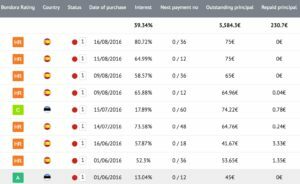 In other words – Aigars is able to earn spreads of 100%+ on loan portfolios where he has not committed any capital himself and where risks are all pushed to individual investors whilst returns all kept to himself. 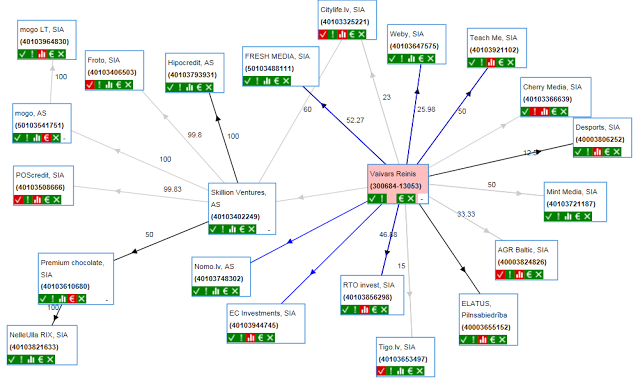 How are Mintos and loan originators connected? My research is based on public company registry information available in Latvia as well as basic online searched in LinkedIn and Google. I have enclosed the original documents as well as simplified overviews created based on this information. HIPOCREDIT – Joint Stock Company “Hipocredit”. The Board and the Council are the same as for MINTOS (AS Mintos Holdings and AS Mintos Marketplace), AS Skillion Ventures and AS Mogo. BANKNOTE – Limited Liability Company “Express Credit”. 3 Council Members, from which all are also represented in other companies like Mogo, EC Investments, Mintos and Skillion Ventures. 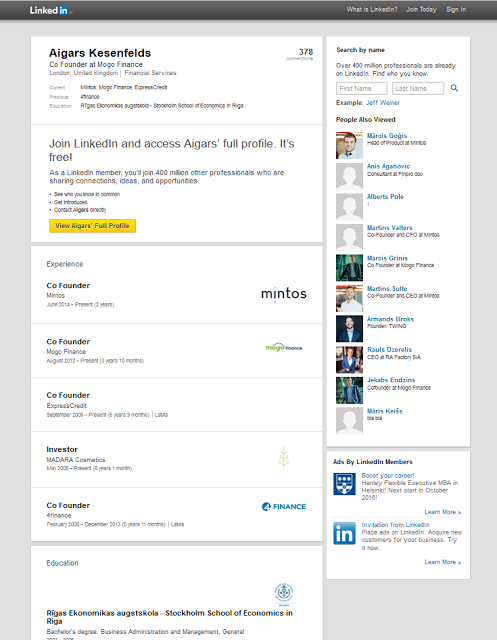 Aigars Kesenfelds is an owner of the company, based on his LinkedIn profile. SIA AE Consulting and SIA Lombards24.lv are the Shareholders for Banknote (SIA Expresskredit) LV, and all three companies share the same Shareholders/Board members. Mogo – Joint Stock Company “Mogo”. The Council consists of 5 Members, from which three members are also in other companies such as MINTOS, Banknote, EC Investments, Skillion Ventures and Hipocredit. Aigars Kesenfelds is an owner of the company, based on his LinkedIn profile. 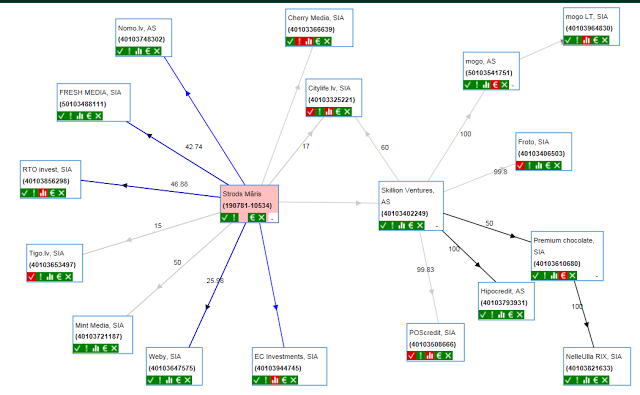 Previously AS Skillion Ventures was also publicly shown as an owner (see visual map above). LLC Lendo is owned by SIA “EC Investments” which is owned by SIA “ExpressCredit” (Banknote). EC Investments, SIA – same shareholders with AS Mogo, SIA “AE Consulting”, Banknote (SIA Expresskredit) LV, AS Mintos Marketplace (LV), AS Mintos Holdings (LV), AS Skillion Ventures (LV). Lendo LLC, SIA “Lombards24.lv”, SIA “AE Consulting”. EC Investments managers have previously been on the board of AS Skillion ventures. Capitalia – Joint Stock Company “Capitalia”. Council has 3 members, from which the Chairman is also a member of the Council in AS Hipocredit. AS Capitalia has a pledge of Creamfinance.